Sunday the 11th of December is International Mountains Day. 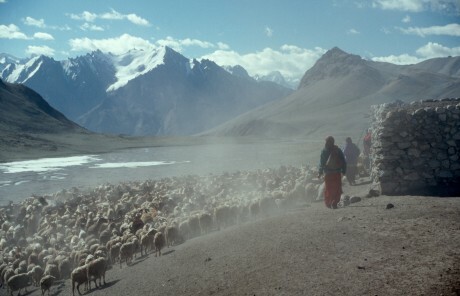 It is nine years since the International Year of Mountains (2002) when Panos London launched the Mountain Voices website, an online archive of testimonies from some 300 men and women living in mountain communities in 10 countries around the world: India, Nepal, Pakistan, China, Lesotho, Kenya, Ethiopia, Mexico, Peru and Poland. In 2000 I carried out the last Mountain Voices oral testimony workshop in Shimshal, Pakistan, a relatively inaccessible community in the Karakoram mountains. At that time the link road to Shimshal was still under construction and it was a two-day trek to reach the village, following a total of 24 hours by jeep and bus up the Karakorum Highway from Islamabad. Many of the Shimshalis interviewed for the project describe their hopes and fears for completion of the link road. The road was completed in 2003, speeding up change and development in the village. Shops and vehicles quickly became a permanent feature of the village. Construction materials could be transported more easily, which facilitated the building of a new school and improved water supply system. More women were travelling to hospital in Gilgit (the closest town) to deliver their babies. 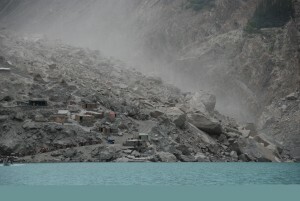 In January 2010 a massive landslide damned the Hunza river forming a lake which submerged 23km of the Karakorum Highway. This happened just south of where the Shimshalis link road joined it. After seven years of increased access and mobility via their link road to the highway, the community of Shimshal, like other villagers situated north of the newly formed lake, find themselves very isolate. They lack reliable access to medical and educational facilities, provisions and off-farm employment opportunities. “For the community of Shimshal, most tragic is the psychological and emotional shock of being isolated again so shortly after experiencing access to the rest of the world. Shimshalis spent 15 years constructing their link road, but only five years after they started reaping the benefits of their hard work they lost that access. People in Shimshal tell me that the pain of having a facility for some time and then having it taken away is more painful than not having the facility at all. Mountain regions are physically dynamic environments and environmental changes of any nature can have significant impacts on people’s social, cultural and economic lives. Panos London is exploring the possibility of re-visiting the Mountain Voices project. The existing archive from the period 1993-2001 serves as a valuable reference to be able to demonstrate the changes (environmental, social and economic) that have occurred in the 10 mountain regions since the first testimonies were collected. In any new project we would aim to support the communities we work with to use appropriate information and communication technology to communicate their testimonies and knowledge directly to urban-based development decision makers, as well as to generate learning and exchange between mountain communities around the world.